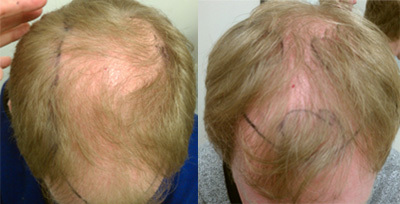 As a hair transplant physician, I see individuals every day who want answers to their hair loss. I have suspected a connection between hair loss and the use of anabolics (substances that alter hormone levels). So I developed the S.hapiro H.igh A.nabolic P.rofile R.atings and O.verview (S.H.A.P.I.R.O.) Chart to easily determine past and current anabolic use, including the use of steroids, growth hormones, whey protein isolate, creatine, arginine, DHEA and andros. Recently, I examined and photographed a pair of identical twins in my hair restoration clinic in southern Florida. Young men in their late 20’s, they were both seeking solutions to their hair loss. The hair loss pattern indicated these twins were genetically prone to male pattern balding. Although they were genetically identical, one had significantly more hair loss than the other. I wondered why, and so did they! I interviewed each twin and filled out a S.H.A.P.I.R.O. chart for each of them. Their scores were significantly different. One had a high S.H.A.P.I.R.O. Score; the other had a low score. The twin who took creatine – which raises DHT, an anabolic effect – shown on the left in the blue hoodie. He had more hair loss than his brother. Both twins opted for a hair transplant and my Accelerated Follicular Restoration(TM) (AFR(TM)) program, which includes taking my whey protein concentrate-based Help Hair(R) Shake after the transplant to get faster results. I also advised the more balding twin to stop taking anabolics, and warned them both to avoid anabolics in the future. Given the relatively low number of monozygotic twins (<0.6% of the population), this hair loss case study was a rare opportunity to compare individuals who are genetically identical but have different rates of male pattern balding. Male pattern balding was premature in both men, but something must have made one twin have more rapid hair loss than the other. Given their drastically different history of anabolic use, this case study may back up my assertion that anabolics can trigger and accelerate male pattern balding in genetically prone individuals. 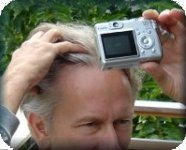 This entry was posted in Baldness, Genetics, Hair Loss, Hair Loss Products, Hair Transplant, Hair Transplant Physicians, Hair Transplants on February 17, 2012 by Larry Shapiro.